I’m just going to come out and say it: I really like the Kia Stinger. I like what it looks like, I like what it represents, I like that it’s a Kia and I like that its trunk opens as a hatch. So when I saw these photos today of a poor Stinger with a Toyota parked on top of it, I got super sad. First seen on PoPville, a Washington, D.C., neighborhood blog, it appeared that the Toyota RAV4 somehow drove up onto the front of the Kia Stinger. We reached out to a witness named Jackie for more details. 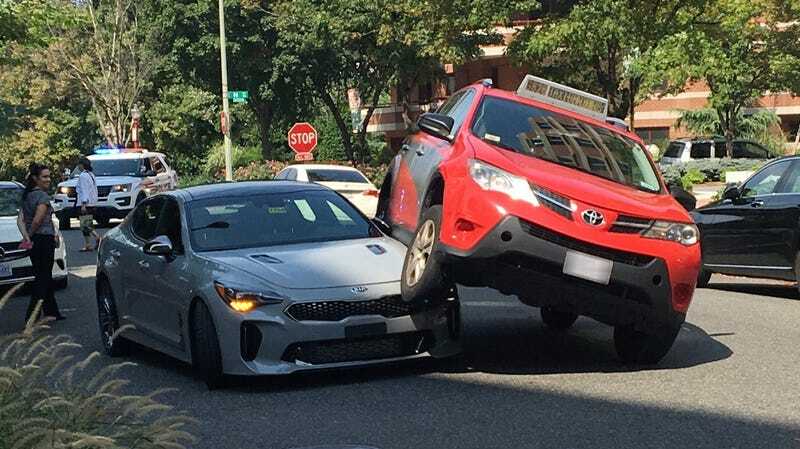 Apparently, the Kia Stinger was parked on the side of the street and the driver pulled out of the spot as the Toyota RAV4 taxi was coming down the street. The Toyota hit the Kia and drove up on top of it. The two stayed that way for two to three hours, like the world’s saddest art installation, before the tow truck showed up. After that, they were able to stabilize the RAV4 and then the Kia reversed away from the taxi. Another source, KR, wrote in to say that one of their friends learned from the Kia’s driver that he had just picked up the car to transport it. Everybody appeared to be fine at the end of the whole ordeal. The Kia was wearing dealer plates, which leads us to believe that this was a manufacturer car and not a privately owned one. Also, because the Stinger isn’t for sale just yet. The Stinger has such a nice face and it’s a shame to see a Toyota stepping on it. The damage doesn’t look too bad, though, all things considered. If there’s a grey Stinger for a shockingly decent price when it goes on sale, I’d double check.